At LyondellBasell, we are dedicated to advancing the next generation of leaders. Our company programs are engineered to develop the skills you need for success now and in the future. Co-op and internship opportunities are the first steps towards an exciting career with LyondellBasell. A LyondellBasell co-op is a type of internship that provides students valuable hands-on experience within their field of study, sometimes earning college credits. Our engineering co-ops work full-time during a single season: spring, summer or fall, with a target of at least two terms prior to graduation. View our FAQs for more information. This program is specific for chemical, electrical, environmental, health and safety and mechanical engineering students. For our corporate business functions, we offer a highly energized summer work term to give students the experience they need. Our corporate office, LyondellBasell Tower, is located in the heart of downtown Houston. For more information, view our FAQs. Corporate internships are offered in the following business functions: accounting, finance and audit; information technology; global security; logistics and supply chain; procurement and distribution; and human resources. We recruit on campus at select universities for their fall and spring career fairs. Check with your school's career center and come visit our booth. View our FAQs for more information about our application process. Most of our graduate hires participated in the co-op program, averaging two terms before graduation. With competitive pay and challenging projects, our co-op program truly defines what it means to work for LyondellBasell. *For Co-ops/Internships outside of the United States, please contact the LyondellBasell facility or office directly for available opportunities. 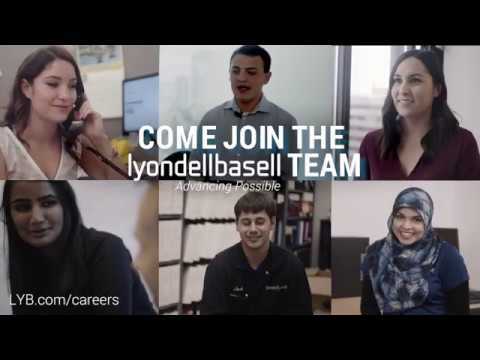 Finding the right career after college can be challenging, but at LyondellBasell we make it easy by providing competitive pay, professional development and world-class benefits. More information can be found at Why LYB and Our People. Our new hires participate in a formal training program with the goal of providing a balanced foundation for each employee as they grow within the company. Optional training is available on a variety of topics for continuous development to ensure future success. Our formal Engineering Development program is designed to build the technical expertise and skills needed for new engineers to grow with their role and the company, ensuring they have a future at LyondellBasell. Learn more about the engineering opportunities available. Have a question about University Recruiting? View our FAQs for more information. Recent graduates find great opportunities at LyondellBasell in a dynamic and collaborative work environment that includes our European Business Graduates Program and Young Engineers Program.